A writer develops a special relationship with his readers, especially the regular ones who really get immersed in his topics and what he is trying to say. The members of this website come from many parts of the world and many different backgrounds. Some gamble online while others frequent brick and mortar casinos. I read all of the comments they post my articles. Their comments range from critical to humorous. They are incisive. And some startle and amaze me with their insight into what I am trying to get across. I respond to all the emails that are posted on this site. And while I appreciate all of the people who write, there is one who is just a little more special than the rest. Now I don't know where Jade calls home, or what she does for a living, or what she looks like. But over the past year or so I am coming up with an image of how she thinks. What I see moves me greatly. I write about strategies, people living and dead who have been gamblers, and I write about places I have visited like Costa Rica, St. Kitts, Nevis, Dominica, Puerto Rico and Grand Cayman. I try to share my experiences, my wins and losses and write about the beauty of the Caribbean islands, the white-sand beaches, the jungles, the green monkeys, and the cruises I have taken. Jade reads my stories, absorbs them, drinks them in and shares the beauty of my experiences. You can read some of her comments at the bottom of the stories published by latestpokerbonuses.com and latestcasinobonuses.com. They are insightful and penetrating. Sometimes I find them more interesting the article she is commenting about. Writing brings out more beauty from a person than he or she would ever share with a friend or relative or a stranger. Some of the most beautiful poetry is often written by people who are serving life terms in prison. A gambler lives on the edge of adventure. To a gambler, it is the journey that is even more important than the results. Jade and many of my other readers share that journey with me. Everyone should have a friend like Jade. Sometimes I find myself thinking of how I would react if I would ever be fortunate enough to meet her in person. Would I like her? Would she like me? Would we be able to communicate on the same level that we reach through these pages? 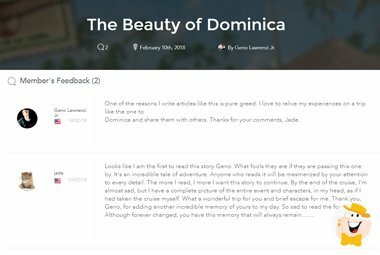 Jade recently made some lovely comments on my article, 'The Beauty of Dominica.' The article told of a cruise two poker-playing friends and I took to the island of Dominica in the Eastern Caribbean and our adventurous trek through a jungle to the island's capital city. I responded to her email by saying much of my writing was selfish. I was simply enjoying the reliving of my favorite experiences and sharing them with others. I know I thoroughly enjoy this experience of writing and reliving my experiences of this thing called life. And people like Jade give that experience an extra special glow.